Boxfishes, cowfishes and turretfishes are the members of the Ostraciidae family. They are found in the Atlantic, Indian and Pacific oceans. Boxfishes (Ostraciidae family) and trunkfishes (Aracanidae family) are easily recognized by their almost completely encased bony shell body. 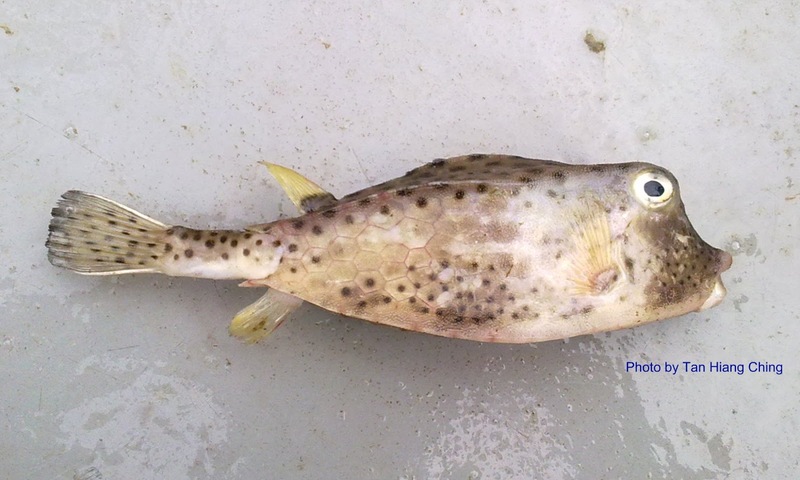 Boxfishes are distinguished by not having isolated bony plates on their caudal peduncle and having 8 branched rays caudal fin. Boxfishes are slow-swimming, benthic-dwelling fishes. They are found on rocky and coral reefs, and over sand, weed, or sponge-covered bottoms to depths of 100 m. They feed mainly on benthic invertebrates and algae. They are territorial and haremic, spawning pelagic eggs at dusk. Some species are reported to have toxic flesh and are also able to secrete a highly toxic substance called ostracitoxin when distressed. There are 8 genera and about 28 species worldwide. Malaysia has about 6 species. Main Diagnostic Features: Two long sharp spines projecting anteriorly from eyes; Two sharp, stout spines projecting posteriorly from rear end of ventrolateral ridge. Size: Maximum total length 50 cm. Main Diagnostic Features: Small protuberance above the mouth and a distinctly concave snout profile.